Title first published in 2003. Contributors from a wide range of European countries illustrate the validity of four propositions about employee participation: that different forms of employee participation mutually reinforce each other; that major shifts in employment relations require innovative approaches to participation; that appropriate conditions (including the provision of training and support) are required for the spread of participation; and that trade unions remain a crucial foundation for the promotion of participation. 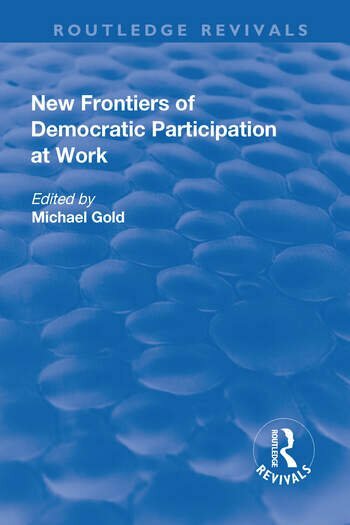 Contents: Introduction: new frontiers of democratic participation at work, Gérard Kester, Edward Zammit and Michael Gold. EU and National Dimensions: EU social policy and developments in worker involvement, Janine Goetschy; European works councils: who benefits?, Michael Gold; The role of economic and social councils in social dialogue, Jacques Monat and Thérèse Beaupain. Sectoral and Company Case Studies: Making sense of democratic participation in the Dutch information and communications industry, Peter Leisink; French and Italian hospitals: the long road towards autonomy, Philippe Mossé; New management systems and worthwhile work: the Swedish experience, Christofer Edling and Ã…ke Sandberg; New concepts in work organization: a case from the Norwegian offshore petroleum industry, Thoralf Ulrik Qvale. Thematic Aspects: Social transformation, self-organization at work and participation in Germany, Helmut Martens; Worker participation in the reduction of working hours in France, Henri Pinaud; Worker participation in negotiating working time in Italy, Anna M. Ponzellini; Worker participation in Central and Eastern Europe: union strategies, Daniel Vaughan-Whitehead; Trade union education and democratic participation: the case of Malta, Edward Zammit, Saviour Rizzo and Joseph Vancell; Index. Michael Gold, Dr, is Senior Lecturer in European Business and Employee Relations at the School of Management, Royal Holloway, University of London.